Any time my daughter and I go to World Market, she heads to the household section and food – I head straight for the candles and this store has a really nice and unique selection. Some are duds and some are gems. You just never know. Clementine Honey caught my attention the moment I saw the jar. I love clementine’s and adding honey to the mix sounded interesting. The moment I smelled the wax, I HAD to purchase one to review. It smelled like fresh oranges. I didn’t smell honey but hoping that comes to life once the wick was lit. 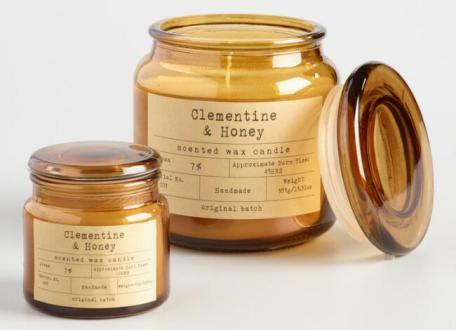 The invigorating scent of sweet clementine fruit and honey. Simple description but accurate. To me, this candle smelled like sweet oranges and sugar. If the honey was in the mix, it was blended pretty well. Time to light this candle! I decided to stick to a small room to burn this candle in and it was a perfect choice. The aroma was strong and amazing in a smaller room. The scent…. sweet oranges with sugar. The honey component – it was there but very subtle. You had to be up close to the candle to really detect any honey. So to me… this scent was solid citrus orange and it was perfect just as it was. Strength – I would rate this candle an 8 out of 10 in a small room. I think it would have been even stronger had the candle burned correctly. One wick wasn’t enough to generate a full melt pool so this candle tunneled straight down around the wick. I was just glad what did melt still scented my bathroom. This candle didn’t burn too great which bummed me out. One wick wasn’t enough to reach a full melt pool so this candle did tunnel. A lot of wax was wasted. Big two thumbs down on burn performance. I really enjoyed Clementine Honey, I just wish it wouldn’t have tunneled so badly. That was the biggest downside. I did like this fragrance itself enough to try it again though, so the next time I’m at World Market, I’ll probably purchase another candle. Hoping the next one I try will burn better… crossing fingers.